It was exactly a year ago, when, in my nausea and vomiting induced haze, I discovered that I could eat avocado. It made sense. Avocado is bland, tasteless, fatty, and doesn't require much chewing. I went crazy for avocado. It was all I wanted to eat. After a long day of raging nausea, I would wake up in the middle of the night with my stomach growling and eat a bowl of rice with mashed avocado. We spent a small fortune on groceries that month, and I gained a ton of weight. I remember thinking that the baby (who was the size of a lemon at the time) must really love avocado. I imagined how sweet it would be to feed the baby avocado after he or she was born. It made me all teary-eyed. 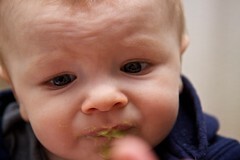 As I was reading up on introducing solid foods to babies, avocados were listed as one of the best foods to start with. And it just seemed so right. That would be the first solid food I would give the baby. It would be what this baby would want, I just knew it. After a couple weeks of an avocado-only diet during my pregnancy, I abruptly got sick of avocado and haven't wanted any since then. That's how it is with a lot of the foods I ate when I was pregnant. Something would sound good to me and I could eat it for a little while, and then it would make me sick again (usually after I had just bought a whole bunch of it). Even now, 6 months after having the baby, I still can't eat those foods. I can't even think about them. To tell you the truth, it made me feel sick to even handle the avocado and mash it up for Will. It makes me wonder if you ever really get over hyperemesis. I'm getting kind of afraid that you don't. Maybe I'd rather not know. Will seems somewhat ambivalent about the avocado. Certainly not as exuberant about it as he was when in utero. On the one hand, it is something to put in his mouth, which he likes. On the other hand, it is a new and different taste, which he isn't sure about. Feeding him avocado the past few days has definitely gone better than it could have, but in all, I'm not sure if he ingested even a pea-sized amount. I guess we'll just keep trying.